US Highway 72; south on Slaughter Road 1.5 miles to a left into Creekwood Subdivision on Maple Valley Dr. Take 1st left on Postwood Court and then 1st right on Harvest Wood Court which ends at the park. Best and most professional course I have been to. Despite it being a more professional course, I would say that it is not overly challenging. Perfect to practice driving distance as most holes have very few near obstacles and are long. Very well maintained with lots of unique attributes. A variety of shots is not imperative to succeed. Winds can be very challenging due to not a lot of tree wind breakup. There are so many people here on weekends, playing disc golf, walking, running, biking, kicking soccer balls, and being obstructive in general. Tough course but fun. Definitely worth playing if you're in the area. So this is my second time playing this course and everything I listed in the first review holds true except I need to add that I know funding sometimes can become an issue for upkeep, maintenance, and repair. I also appreciate the time and preparation put in for design, layout, clearing, as well as fundraising for this course. So I want to say thank you to LaVonne Wolf for his dedication to the sport of disc golf and providing us with this course. CON: The Tee Signs are laughable at best. Bring a course map!!! Championship caliber course for sure. This is a modern era course located in the center of a very large public park. Designed by Lavone Wolfe, the father of Alabama disc golf should say it all. Being the longest course I have ever played, I finally got a taste of what the big boys play on. 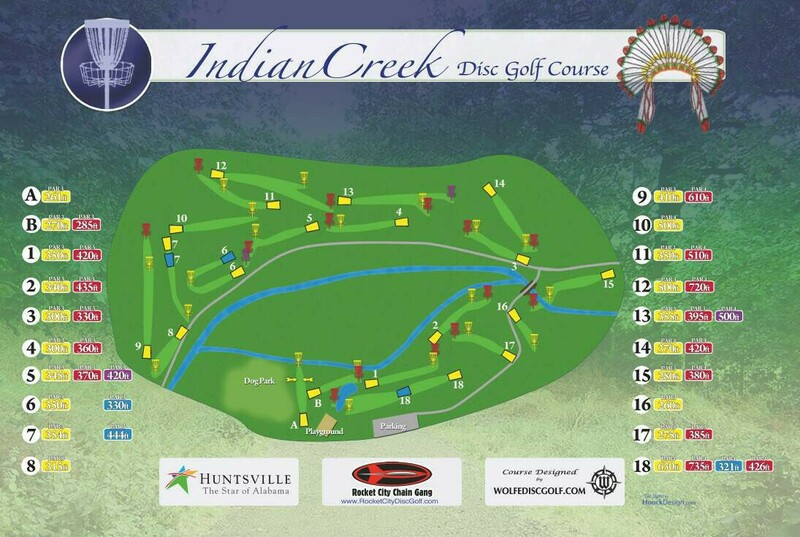 Water hazards, OB, Mondo, and overall course length including over half the pin locations over 400ft, one over 600ft, and 2 over 700ft will force you to use every disc and shot in your bag. Did I mention water? You have the distinct opportunity to enjoy it in play on 5 of the holes. A nice added touch is the permanent multiple pin locations on a handful of the holes. Most courses only bring out the extra distance during monthly's and tourneys but it is available full-time here kids. CONs: Public park full of joggers, bikers, groups, and children may force interaction and take away from your concentration. ADVICE: Print a map b/c of the multiple pin location. If you don't you will be confused and add a longer walk to an already long hike. Check the Rocket City Chain Gangs website to see a list of events and tourneys at local parks prior to showing up on the weekends, so you don't run up on one a this park and have to settle for Brahan or the others. I agree with the very challenging. I'm relatively new to disc golf, but I've played a variety of courses. This course is long! Take a bottle of water this one is a trek. I liked the open fairways and the baskets were often in a challenging location. Two "warm up" holes to start was nice. Unexpected challenge, finding my discs in the tall grass. If your familiar with Braham Springs Park narrow and short, 300FT or less, in the pine trees for 16 of 18 holes. Indian Creek is the opposite. 2-3 holes in the woods and the rest 300FT or longer. Fun & Challenging. It was fun throwing as hard as you can to get close and not worrying about losing a disc to the woods or water.